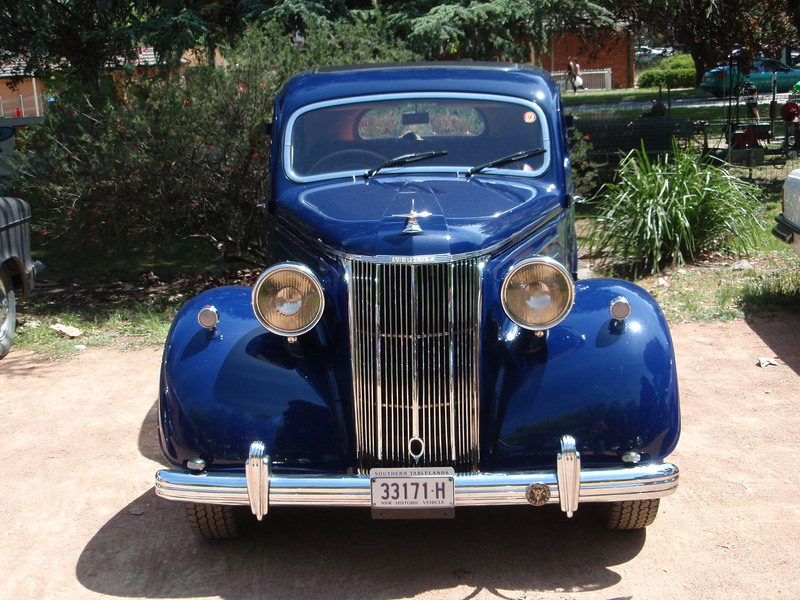 BONNIE – July 2006 – – Southern Tablelands Heritage Automotive Restorers Club Inc. Although I was already the proud owner of a classic car, a 1964 Ford Anglia Estate Wagon, I was not quite satisfied. I still yearned for the endearing sound of the mighty Ford V8, which I had not had the pleasure to hear since my teen years. John Corbett saw an advertisement in the Trading Post. There was a Ford Pilot for sale at Cordeaux Heights near Kiama NSW. The advertisement said “Restoration had been started”. As I was soon to find out, this meant that all that had been done was the front and rear seats had been reupholstered! The rest was sitting there in bits around the shed, waiting to be done. The vehicle originally belonged to a Mr Gillett (his name and address was inside one of the hubcaps) and now belonged to one of his relatives. It was quite obvious why progress had ceased when I saw the state of the car. My first comment when I saw the car was “Oh S**t”. But this was a challenge I was prepared to undertake. I was perhaps looking through rose coloured glasses at the time but this beautiful old V8 needed to be rescued. The vehicle even had a sordid past. Apparently it had been stolen and used in a robbery in Newcastle. There was a bullet hole in the rear passenger window. So after consulting with Hugh Spencer, we hooked up Hugh’s trailer to his 4-wheel drive and headed off to Cordeaux Heights to collect my ‘Bonnie’. (From Bonnie & Clyde fame). I decided to give myself a deadline to complete the restoration, so I registered to go on the ‘Great Ocean Tour’ with the Canberra Antique & Classic Motor Club in 12 months time. I began by totally stripping the chassis, cleaning up all the rust, which seemed to be more and more the further I looked. My welding and fabrication skills came in handy. As the ‘Great Ocean Road Tour’ grew nearer, I was starting to panic and I was not sure if I would make it in time. But things started to fall into place. The only changes I made were to convert ‘Bonnie’ to 12 volt & put softer linings on the brakes. I could not say how much it cost to restore ‘Bonnie’; I stopped counting at $25,000.00. It was time for the ‘Great Ocean Road Tour’ and ‘Bonnie’ was ready. The purr of the V8 motor was music to my ears. Everything was ‘spot on’. I did have one hiccup on the trip. Every 50 to 100klms I had to stop and clear the fuel filter. Apparently a rat had made a nest in the fuel tank and parts of it were going through the fuel line. Apart from this ‘Bonnie’ had a dream run. 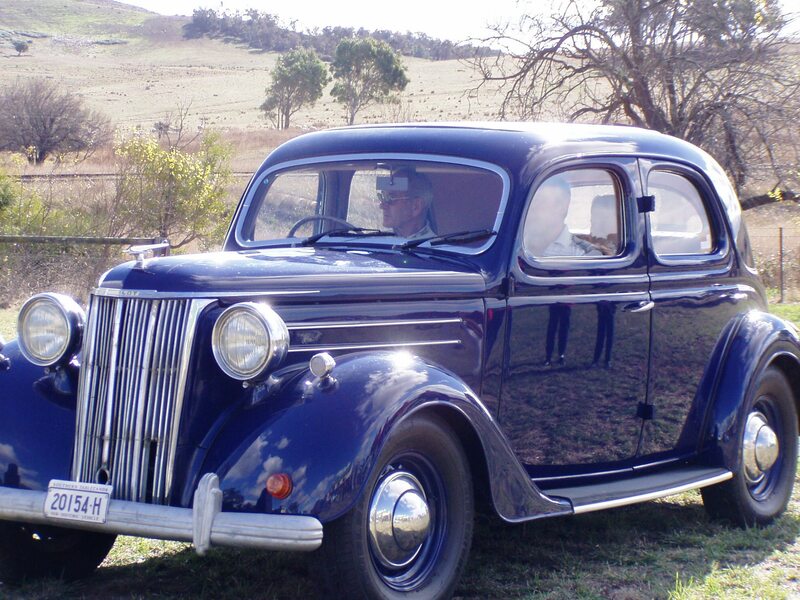 What a great feeling motoring along the Great Ocean Road in my beautiful ‘Midnight Blue’ Ford V8. Upon my return I made contact with the daughter of the original owner, Mr Gillett. She advised me that her father had passed away just two months before I completed the restoration. As it happens she was coming through Goulburn on a bus trip. I arranged to meet her and take her for a drive in ‘Bonnie’. She was thrilled that her father’s car was restored and wished her father could have been there to see it. I knew then that all the hard work was worthwhile. “Bonnie lives on.” ……………………………….Ron Smith. thank you so much for your lovely article. It is a true reflection of my brother’s passion, skills and dedication. Although Ron has passed, his spirit lives on in ‘Bonnie’ we honour him in every run.